Time to start the in-depth reviews of some of the gear used in Russia. I had the Hyperlite Mountain Gear ECHO I Shelter System since a couple of months, doing a few overnighters in it and then of course putting it up and down for eight nights in a row in Russia. Enough nights spent under it to make a objective review, and to let you know if it is worth the money. The weights on the HMG site are without guylines attached, (I took the HMG weights with guylines as stated by Dan on the BPL forum in this thread); also, I got a pre production sample so the to-be-expected weights are what's stated on the HMG site, which are not far off as you can see. In case you're still asking yourself, what is it made of, then the answer is cuben fibre. It is my first cuben shelter, and the weight saving in comparison to my Gossamer Gear Spinntwinn is 52 g. The advantage with cuben versus spinnaker is that cuben is 100% waterproof and even more tear resistant, and well, super strong and lighter. As a UL backpacker, lighter (usually) equals better. Now that we got the important bits out of the way, lets get to the tasty chunks. As a starter, I serve today this HD video of how to set up the complete shelter. Click here to see the Youtube version. There were some questions about the speed of my pitch, and if it does take so long or if it is difficult to set up the ECHO I. The short answer is "No". The more detailed answer is, in the video I try to do it more slowly to be able to show and explain things, and not just hurry through it as I would in a downpour when on a mountain. I'm also a perfectionist when it comes to setting up my shelter, so I make an effort to get it pitched flawless. Hence the "slow" speed, for a normal, flawless pitch I need around three to five minutes, which probably seems like an eternity to people sleeping in a Tarptent Moment. Anyhow. 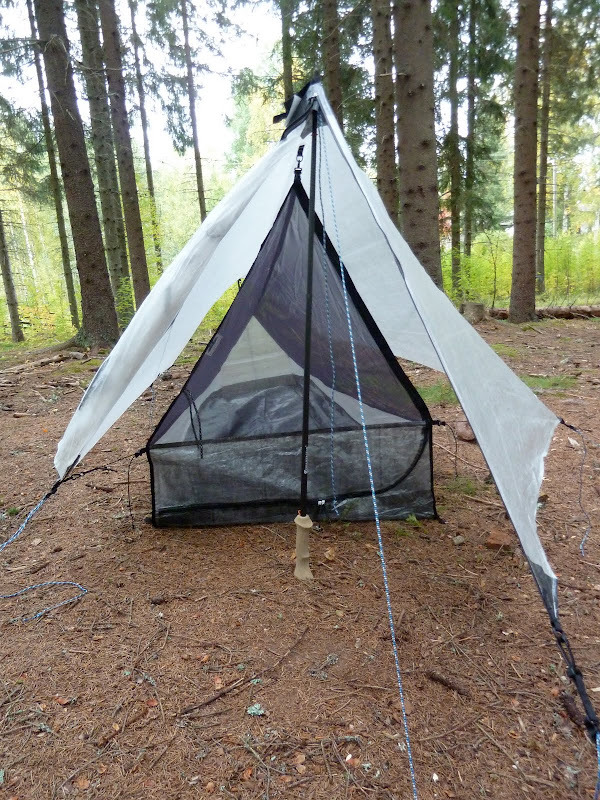 I have used the tarp mostly, as there aren't much bugs around anymore which would make me take the inner. I am thinking about if I might take the inner in winter, but am not sure yet. The beak was used on the days that I got extra gear (as a Daily Guide you get to carry a Satphone, GPS and two massive First Aid kits) so the extra space came in handy. Also if it is raining or very windy, the beak will come in handy. And of course one could use the beak as a Mini tarp just for the head when bivying. When good stake-out points are rare, attach it to a tree! The tarp is one person + plenty of gear size, though you could squeeze with two and gear under it if you really like each other. I found it perfect for my needs, the smaller size also means I need less space for pitching it, which is great - so often in Russia I pitched in places where there was no a lot of good spots, so having a small tarp definitely put me at an advantage - my SpinnTwinn would not have fit some of the spots where I pitched, as it is so much wider than the ECHO I. So if you tarp a lot in areas where space for a good, perfect pitch, is at a premium, you will, like me, value the good size of the ECHO I. Extra rain and wind protection with the beak. Speaking of size, the ECHO I tarp is 262 cm long, 213 cm wide in the front and 152 cm wide in the back. I can fit all my gear underneath the tarp, often at the foot end while only keeping the essentials - puukko, headlamp, water, camera - with me in the front, but I also can spread them out, for example while packing. The quality is topnotch, as you would expect. The tarp has catenary curves everywhere - ridgeline, front, end and sides - and instead of sewing them, which would weaken the material, they're bonded. The tie out points are reinforced and it comes with custom made, that means in HMG's colours, guylines. My problem with the guylines is that they're a bit heavier than other lines, and also they're not reflective. I like reflective guylines, as they help other people not to trip over them - that's my usual problem & worry. In case you're not using trekking poles, you also can cut & sharpen sticks and pitch with them. On to the beak. A very nice addition for when wind and rain are coming down horizontal from every direction. It is easy to attach with the help of buttons, as you can see in the video or on the photo underneath. It comes with a two way zipper which is waterproof, and it runs very smooth and doesn't get stuck in other material. Now attaching should be done under the front guyline, but I always do it over the front guyline as that's easier for me. You can attach both beak and front guyline to the same peg, but I like to use two different pegs. Also, when using the beak you should tie out the sides, something I usually don't do. While possible to do without, it is tauter and more stable when you do. Furthermore, and these questions have been raised elsewhere as well, some might wonder why there's no beak or wall for the back - after all, when you pitch into the wind and then it turns 180°, what then? The reason (or my reason, for that matter =) is that HMG assumes you'll use the complete system, so tarp, beak and inner. The inner, as you'll see, has a full wall in the back and thus would, if used with the beak, provide 360° coverage. Just looking at the weights, I personally would rather have a wall or beak for the back instead of the inner, as that separate beak/ wall for the back would be lighter than the inner. Buttons to attach the beak in front. D-Rings to attach the beak at the side tie-outs. Back wall of the inner. Thus the inner. The heaviest piece of the shelter system, it gets attached with bungee cords to the tarp and you can get it nice taut with the line-locks. I haven't used this at all yet on a trip, but given that you can pitch it on its own - bug invested summer days - or with the tarp - bug invested summer days with rain - I can see it as a possible replacement for the LightHeart Gear Solo tent I used last summer. It has a tough black cuben floor and high sidewalls, as well as the aforementioned cuben back wall. The top and front have no-see-um mesh, and the door is fully openable with a two-way zipper. Front door of the inner, with and without beak. The inner is 185 long and tapers from 81 cm wide in the front to 51 cm in the back. It is enough for you and your sleep system, but your gear will stay outside. That shouldn't be a big problem, though, as there's still plenty of tarp covered space to hide under for it. You can peg out the inner with the loops at all four corners, which makes life a bit easier and also keeps it in place. Full system - inner, tarp & beaks. While moving in, pitching the front slightly higher. As the regular reader knows, I really enjoy tarping, so it is with great pleasure that I now carry even less weight with me when out on a trip. The modularity and high craftsmanship of the Hyperlite Mountain Gear ECHO I is its strongest selling point. You buy one system to suit all your needs. For spring and autumn you take the tarp and maybe beak, in the summer its the inner and tarp and in winter you take all three to have a bomb-proof shelter. 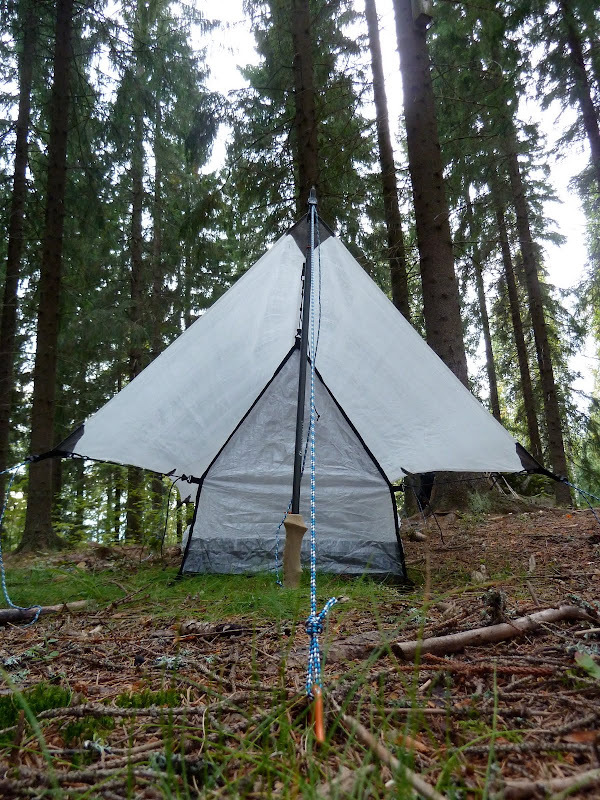 What I could imagine, taking HMG's modular approach on step further, is that they could introduce a full cuben inner with small mesh windows at the top for winter use. In winter I'd like to keep the wind at bay, and with a double-wall shelter I even might gain a degree or two in warmth. I also can imagine that it's lighter than the mesh version =) I'd also like to see a beak/ wall for the back on those days where I wouldn't take the inner but would like full 360° protection. To conclude, I really like the ECHO I and I believe it could become my dedicated solo trip shelter. Its small footprint, light weight and modularity all speak in favour of it. It is easy and fast to pitch, looks great, and it is a joy to wake up under! It packs very small and I carry it, like my other tarps, in the outside pocket of my pack so it is easy & quickly accessible. 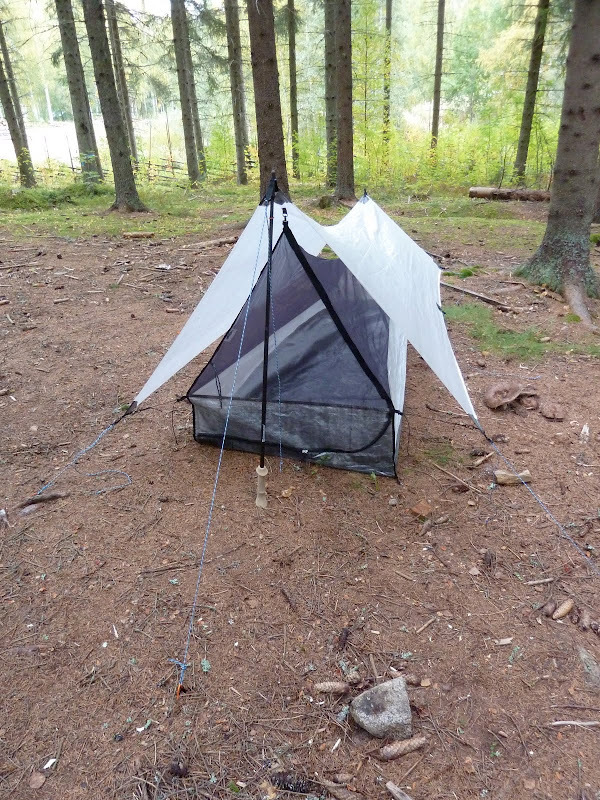 Finally, I will use this shelter during the coming winter, so you can expect a long-time review sometime next spring. The price for the ECHO I is 490$ plus shipping, and you can order one directly at Hyperlite Mountain Gear. If you want to learn more about HMG, check out the interview with Mike St. Pierre, the Founder and CEO of the company, which I did a while back. Pitch on a ridge with a view.